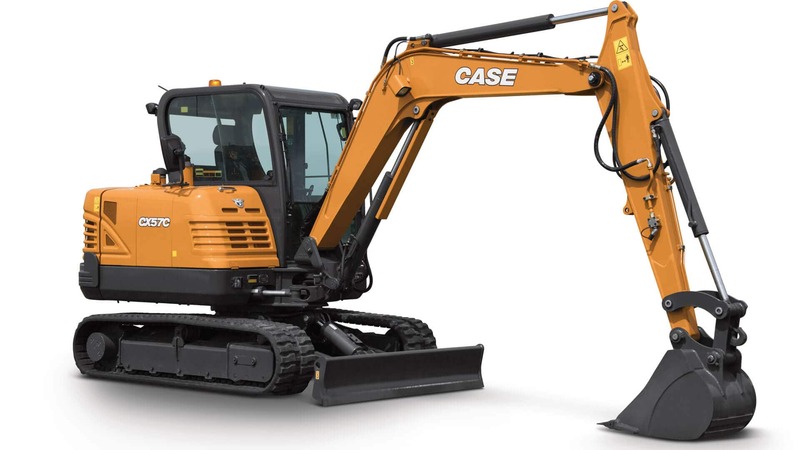 CX57C is a “large” mini excavator with best-in-class horsepower, capable of handling the demands of heavier excavation operations. Its design stands apart from the rest of the C Series line because it features a conventional tailswing design with a large counterweight, giving it power and performance comparable to a larger class – all while still taking up a relatively small footprint. 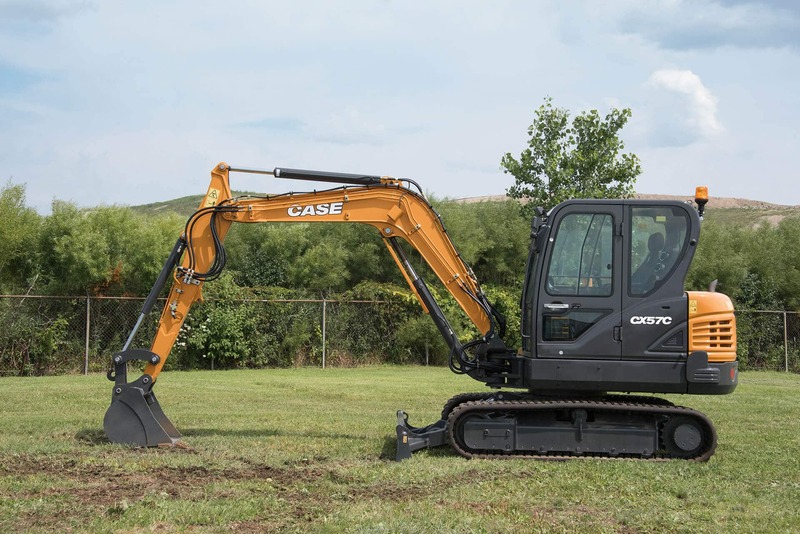 Standard performance features and a standard deluxe cab with LCD touch screen monitor make the CX57C a powerful, versatile and intuitive mini excavator. The best-in-class 67 hp. and larger counterweight empower the CX57C to deliver digging forces of 9,550 lbf. and a lifting capacity of more than 9,200 lb. while still maintaining a track width of 6 ft. 4 in. and operating weight of 8,300 lb. This small-frame strength is supported with standard features such as a hydraulic push blade for backfilling and improved stability, auxiliary hydraulics for easy thumb and attachment use, Automatic 2-Speed Travel for smoother shifting across varying terrain, and a pattern selector for simple switching between SAE or ISO controls. The adjustable boom can be offset to the left or right, allowing for nimble operation in confined applications or around obstacles. Optional features include a long-reach configuration and steel tracks for greater durability and performance in harsh underfoot conditions. Contractors count on the CX57C for its compact power. This is why it utilizes a combination of emission technologies to meet Tier 4 Final regulations, resulting in a fuel-efficient design without sacrificing strength. Two operating modes help operators efficiently dial in performance to the task at hand and a standard Auto-Idle function further reduces fuel use. 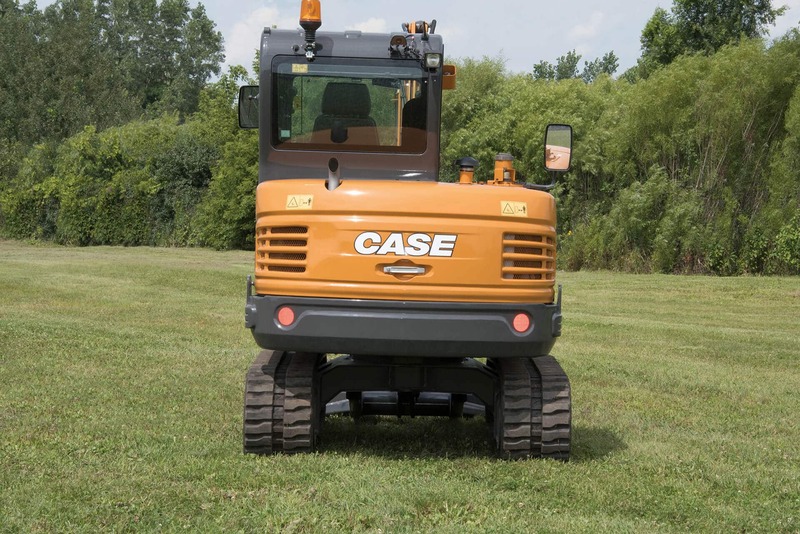 Despite its "mini" classification, the CX57C comes standard with a deluxe cab offering the productive comfort and features of many full-size machines. 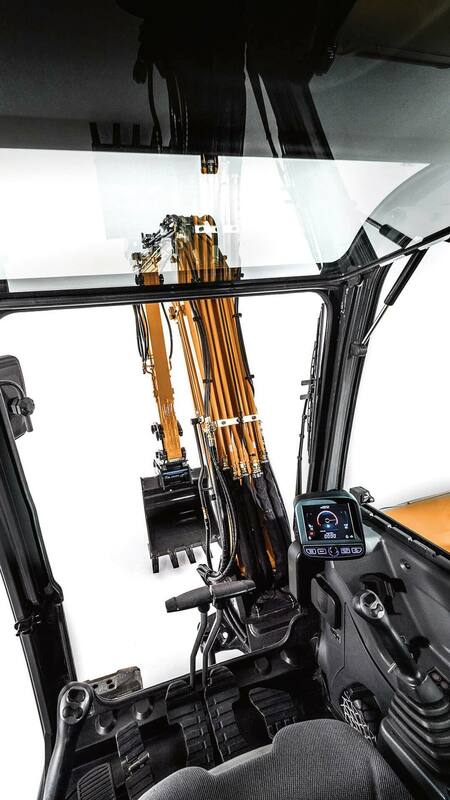 The ISO cab helps seal out noise and reduce vibration, features floor-to-ceiling glass for excellent all-around visibility, and standard amenities include heat, A/C, Bluetooth radio with USB input and remote, proportional controls, an adjustable heated seat, and a 5.7-inch color touchscreen monitor. This monitor provides quick visual reference of real-time performance data, convenient access to important functions and can be integrated with the optional rearview camera. Two self-locking panels provide ground-level access to all main service and maintenance items, including checkpoints, fill ports, grease points, filters and more. This allows you to quickly and more easily maximize the life and performance of your machine.